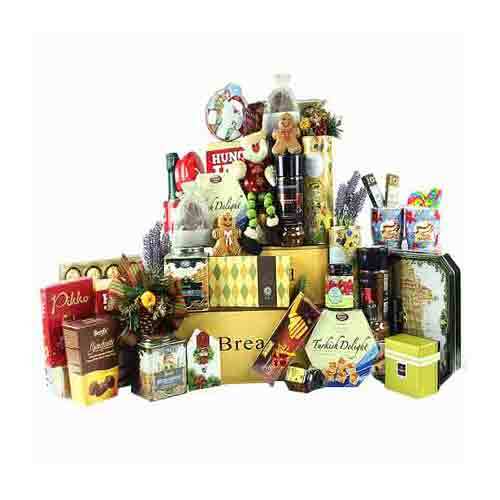 Description: Acknowledge the people who love you by sending this Joyful Royal Hamper of Gourmet Treats and make them realize their worth in your life. 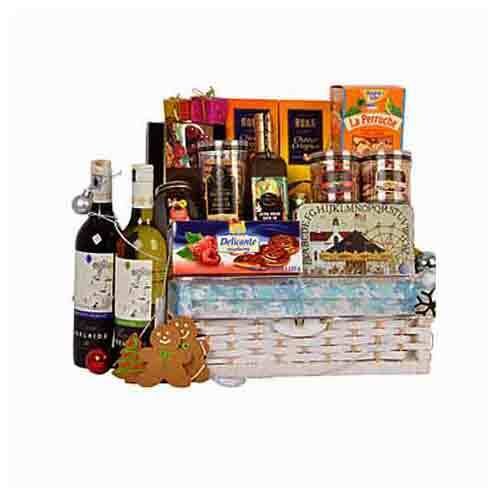 This Hamper covers a Bottle of Trapiche Astica Chardonnay Argentina 2006, a Bottle of Alexender Anour De Nos Merlot 2013, Mark N Spencer Crisp Bread (125 gr. ), Mark N Spencer Metropolitan Biscuits w Thick Belgian Chocolates (150 gr. ), Ross Cottage Mixed Cranberries Blackcurrant (288 gr.) Homemade Kroft Assorted Gingerbread (125 gr. 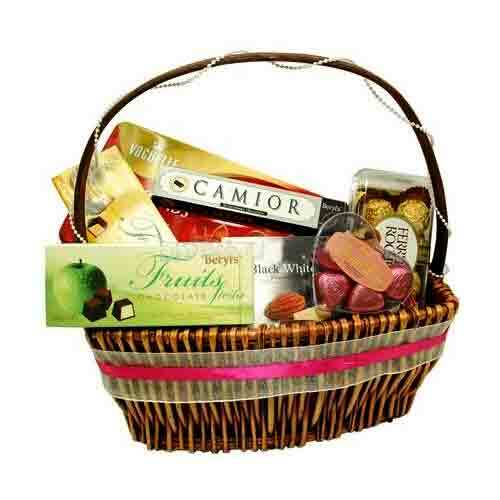 ), Sante Granola Raspberry, Cranberry, Chokeberry, Strawberry Fruits (500 gr. ), Woodcott Extra Virgin Olive Oil (500 gr. ), Woodcott Carob Honey (250 gr. ), Royce (Hokkaido) Macadamia Chocolate (170 gr. ), Ross Cottage Roasted Honey Almond N Cashew Nuts (148 gr. ), Ross Cottage Mulberries (110 gr. 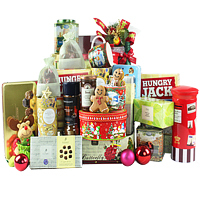 ), Decadence Limited Edition Fruits N Nuts and Homemade Almond Ginger Cinnamon Star (100 gr.). All these items are beautifully placed in a Hoolaney Chest Basket accessorized with seasonal trimmings. 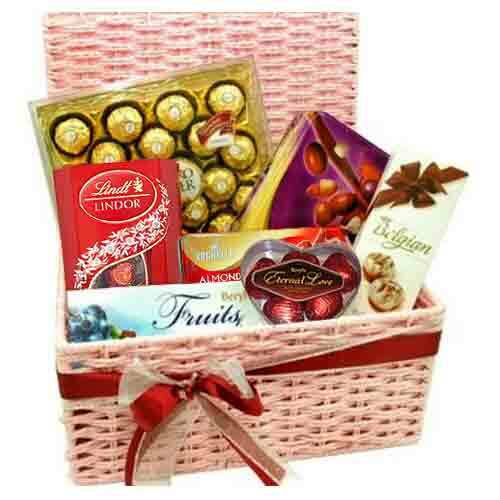 This basket includes:- Beryl's Chocolate & Ferrero Rocher(16pcs) Chocolate In a Basket Arrangement. 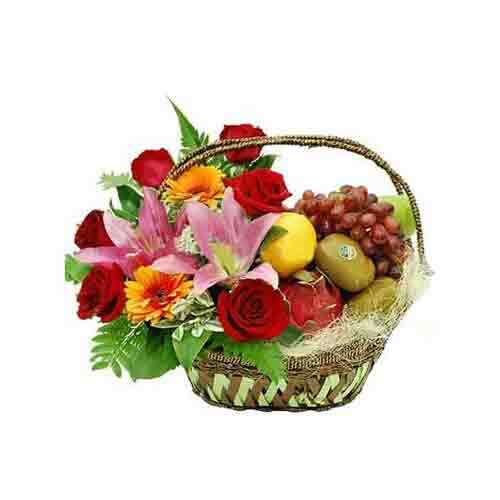 If you really want to give something special, then this wonderful arrangement will solve your problem. 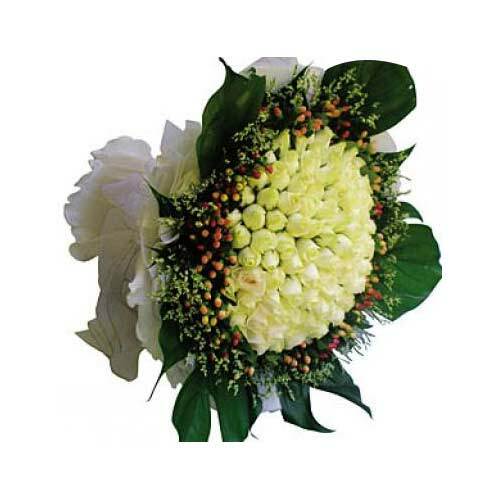 These 99 stalks of cream Roses with Berries is a perfect gift to say "I LOVE YOU" & to win her heart.